Milsek Leather Cleaner and Conditioner is strong enough to gently clean dirt and remove stubborn stains from your leather furniture and effective enough to condition leather. Milsek Leather Cleaner and Conditioner is strong enough to gently clean dirt and remove stubborn stains from your furniture that were caused by pets or spills by children, and effective enough to condition as well. 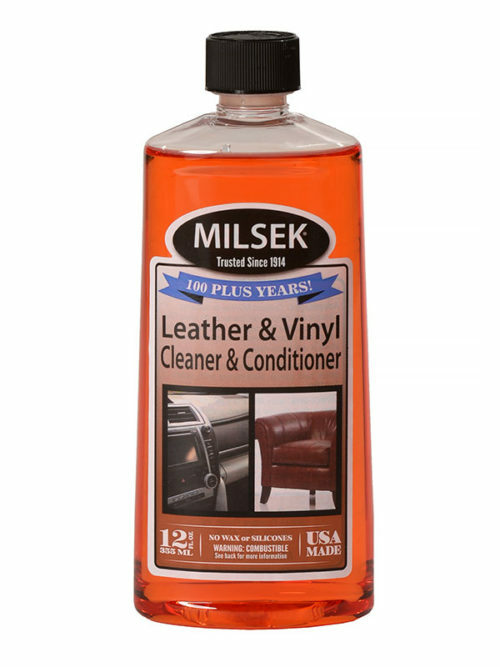 Milsek’s natural orange leather cleaner and conditioner moisturizes leather and vinyl, which prevents drying and cracking. All that’s left behind is the ultimate shine and fresh scent of mandarin orange. Milsek Leather Cleaner and Conditioner will not build up because it does not contain wax or silicone. Milsek Leather Cleaner and Conditioner can also be used on leather jackets, coats, purses, boots, accessories, horse tack & saddles and car interiors. Simply dampen a soft cloth with water – but not too much water. Just damp, not soaked. Then pour the Milsek on the cloth and gently wipe down the surface. Because of the nature of leather, we recommend trying this product on an inconspicuous area first. All leather and Vinyl furniture – Apply Milsek Leather Cleaner and Conditioner to a soft cloth and wipe down furniture. Buff dry with a clean soft cloth. Milsek will leave your furniture dust and dirt free as well as conditioning it. Leather Car Seats – Apply Milsek Leather Cleaner and Conditioner to a soft cloth and wipe down seats in your vehicle. Buff dry with a clean soft cloth. Milsek will clean, and condition your vehicles seats. Car Dash Boards and plastic surfaces in cars – Apply Milsek Leather Cleaner and conditioner to a soft cloth and wipe dash board and any plastic surfaces in your vehicle. Buff dry if needed. Milsek will remove dust, dirt and clean surfaces while giving your car a clean orange scent. Leather Saddles and Tack – Apply Milsek Leather Cleaner and Conditioner to a soft cloth and wipe down saddle or any leather tack. Buff dry with a clean cloth. Milsek will remove dirt, dust and mud from a hard day of horseback. Leather Baseball Gloves, Leather Purses, Leather Boots, Leather Jackets Leather Briefcases & Attaché Bags – Apply Milsek Leather Cleaner and Conditioner to a soft cloth and wipe down item. Buff dry with a clean cloth. Milsek will clean, condition and remove dust and dirt.